The King James Version of the Bible was first published in 1611. Its literary brilliance is well known; its words and phrases have had a unique influence on the English language. 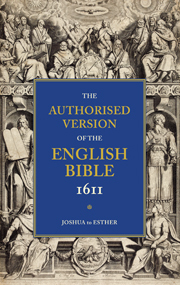 Most of today's KJV Bibles use a text with hundreds of small changes introduced by editors and printers in the sixteenth and seventeenth centuries - some accidentally, some intentionally. The text commonly available now is actually that of the 1769 revision, not that of 1611. In fact, there were two printings in 1611, both carried out by Robert Barker, the King's Printer of the day. The first contained a number of errors which were corrected in the second, so even the two earliest editions contain many variations. In 1909, Cambridge scholar William Aldis Wright represented the original text of the first edition in a clear and readable form, together with a list of variations between the two 1611 printings - a resource that is unique to this edition. Cambridge is re-issuing that edition as part of its digital reprint programme for classic and previously out-of-print books.